It’s easy to find SEO advice on the internet, but much of that advice is geared towards boosting your visibility all over the world. For businesses that provide a local product or service, such as restaurants, salons, and cleaners, local SEO is much more important. Local search is what gets customers in the door and increases your sales, so if you haven’t been optimizing your web presence for customers who live nearby, now’s the time to start. Small-scale SEO is complex, but it’s no more difficult than general SEO. However, if you’ve been doing general SEO, you’ll need to shift your focus a little to improve your local search rankings. This guide will get you off to a good start, whether you’re a local search beginner or you want to improve your existing strategy. Most of the time, when someone wants to find a product or service in their area, they’ll search by location as well as by keyword – e.g. “food delivery Lexington.” Therefore, it’s a good idea to integrate your location into at least some of your keywords, or you could be missing out on a lot of traffic. After you choose some good keywords, you’ve got to use them effectively. Step 4 goes into more detail on how to do this. One of the best ways to make yourself findable online is to list your business with Google, Yahoo, and Bing. Creating a business listing on Google My Business is especially important for increasing your visibility and getting your business on Google Maps. You can create your free listing at https://www.google.com/business/. Setting up your business listing on Google will go a long way towards improving your local SEO. Setting up a Google My Business listing. Bing and Yahoo aren’t as big as Google, but they’re still valuable resources, so don’t forget to set up business listings with them as well. You can set up a Bing Places for Business listing at https://www.bingplaces.com/ and a Yahoo listing at http://www.yext.com/pl/yahoo-claims/index.html. Yahoo has partnered with Yext PowerListings to provide free business listings and scans. Once you’ve created your search engine listings, work on getting your business into as many other directories as possible. Yelp is one of the biggest and best-known business directories out there. Yellowpages.com and Manta are a couple of other big ones. Some directories have general information on all kinds of businesses, while others focus on specific business niches, so do your homework and see which ones pertain to your field and location. Remember the local keywords you chose back in step 1? Now it’s time to make sure they’re working well for you. Take a look at your page title and your meta description, and make sure both of them contain your business’ name as well as your location. Here’s one of the first-page results for “Hartford florist.” Notice how the title (in red) and the meta description (in green) both contain the business’ name and location. Next, take a look at your web copy. Your keywords should be placed strategically through your website. Search engines give more weight to terms in header tags, especially H1 tags, so use your keywords there if you can. If you have a blog, scatter your keywords throughout your posts. Just be sure to use your keywords as naturally as you can. Google penalizes keyword stuffing, and human visitors don’t want to read a page that looks like it was written by a robot. After that, it’s time to add some structured data to your site, if you aren’t using it already. Structured data is the extra information that shows up with listings in SERPs. It provides extra information about your business – like your hours, prices, and ratings – to both search engines and human searchers. Here’s what structured data looks like in search engine results. Having clear, complete structured data on your site boosts your rank a little. It also makes your listing more appealing for searchers. If you don’t know how to create structured data, don’t panic – it’s actually very easy. Google has a structured data markup helper that generates the right code for you after you input your information. Google’s structured data markup helper walks you through the process of creating structured data for your site. Finally, make sure your site is mobile-friendly. According to Google, 40% of mobile searches have local intent and you don’t want to miss out on that traffic. Responsive web design is one of the simplest and most effective ways to ensure your site works as well on mobile as it does on desktop. According to Google, social media isn’t a ranking signal for SEO but that doesn’t mean it can’t help you. The more places your business can be found, the better it is for your brand’s image and visibility – there’s a reason businesses that have mastered the art of social media also tend to rank well in search engines. Use social media to build a local audience and create a sense of community. One good way to do this is to have regular sales or specials for your social media followers. You can also promote your blog posts on Twitter or Facebook for more exposure. When someone leaves you a comment or message on social media, always respond. That makes your business seem friendly and receptive. Check your listings around the web for consistency. If someone goes out of their way to find you online, you don’t want to give them the wrong information. Review the business listings you own, and Google your business to find any other mentions of your business online. If any of the information you find is out-of-date or inaccurate, especially your business’ name, address, or phone number, update it right away. Encourage customers to leave you reviews. Good reviews are incredibly important for your business’ image. 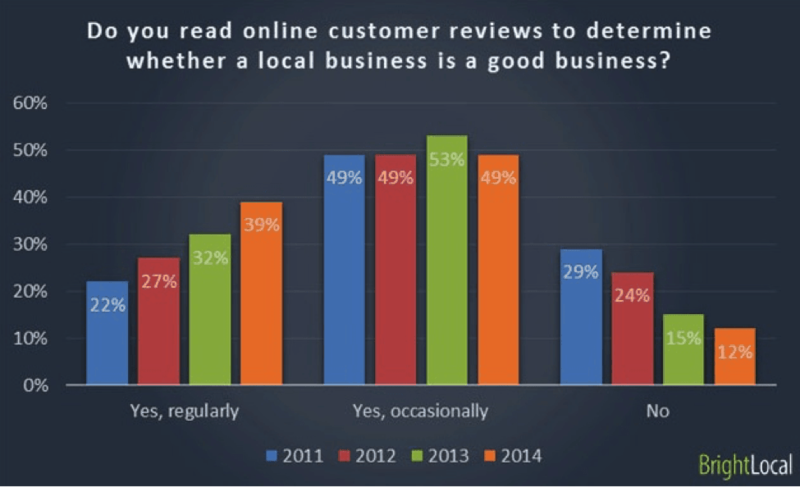 People trust reviews – in 2014, 88% of consumers said they relied on reviews to decide whether a local business was worthwhile. Reviews build trust with customers in a way that other marketing tactics can’t. Good reviews can also give you a boost in rankings. Google’s own reviews are most important for this. Don’t overlook other review sites, though. Your Yelp reviews might not directly impact your SEO, but they can give your reputation a valuable boost, which is often worth just as much. How can you get reviews? Ask! Ask customers in person after they buy something from you, use the space at the bottom of receipts to print a request for reviews, or ask your social media followers to leave you a review if they liked your product or service. You’ll start getting reviews a lot faster if you ask than if you just wait for people to do it on their own. What if you get a bad review? First of all, don’t sweat it – even great businesses get bad reviews now and then. One critical review won’t be the end of your business. The best way to react is to keep a level head and respond professionally. Don’t get angry, and don’t ignore the dissatisfied customer. Do your best to make things right, even if you don’t think the customer is being reasonable. You and your business will look good if you take the high road. Don’t be intimidated by local SEO. It isn’t an easy thing to master, but with some research, even a beginner can get good results with it. For many small businesses, local SEO is so important that even a few small improvements can net you significantly more sales (and happy customers). Get started with the steps in this guide today – you’ll like the results. Which local SEO techniques have had the best payoff for you? Let us know in the comments!